Anyway, when I decided to make this recipe I realized that I was lacking in pretzels (which were what originally crusted these cups)--so instead I made little graham cracker crusts. 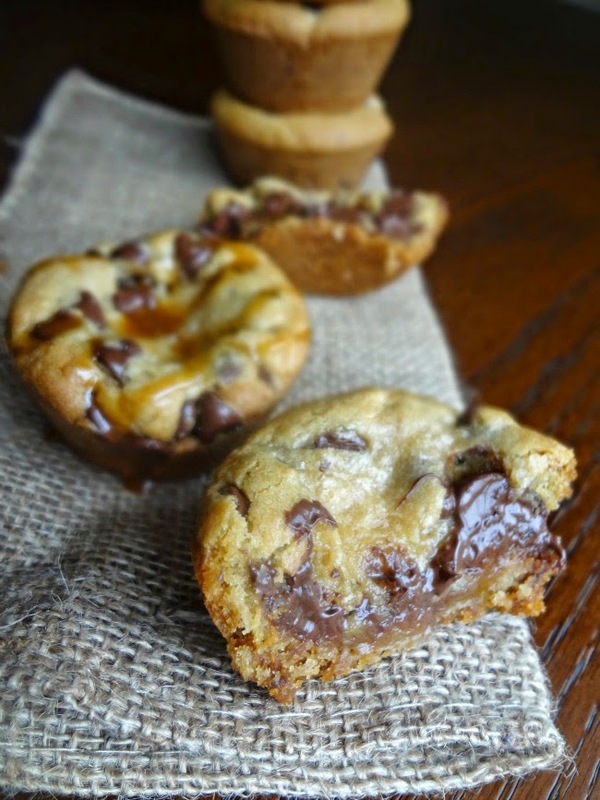 Which meant these cookie cups taste a little s'moresy...ya know...minus the marshmallows...stay with me on this. Cookie cups are great-you never have to worry about if they're going to rise correctly or spread too much or anything. 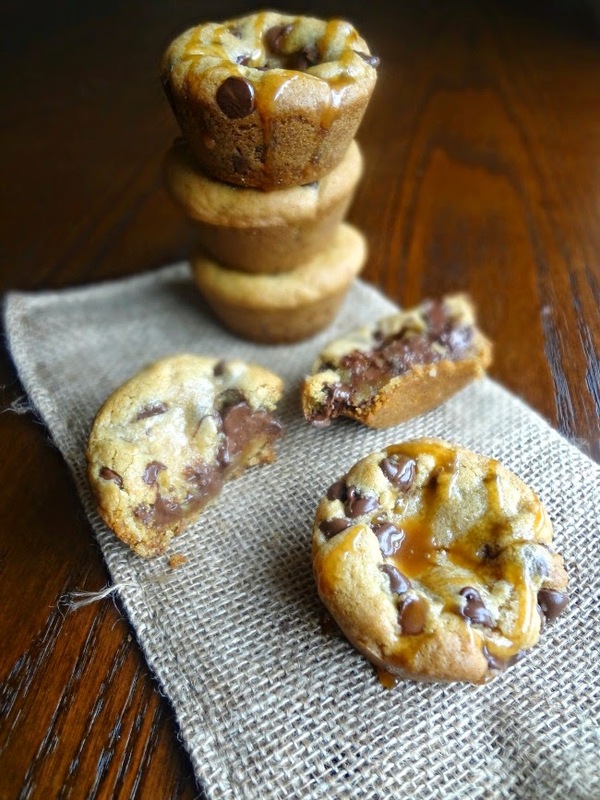 They just bake up in their little muffin cups and you are guaranteed a thick, chewy, gooey cookie. Plus, now there's a whole world of putting a crust on your cookie. So it's like cookie + pie. Amazingness. These cookies are perfectly portable yet soft and gooey on the insides. 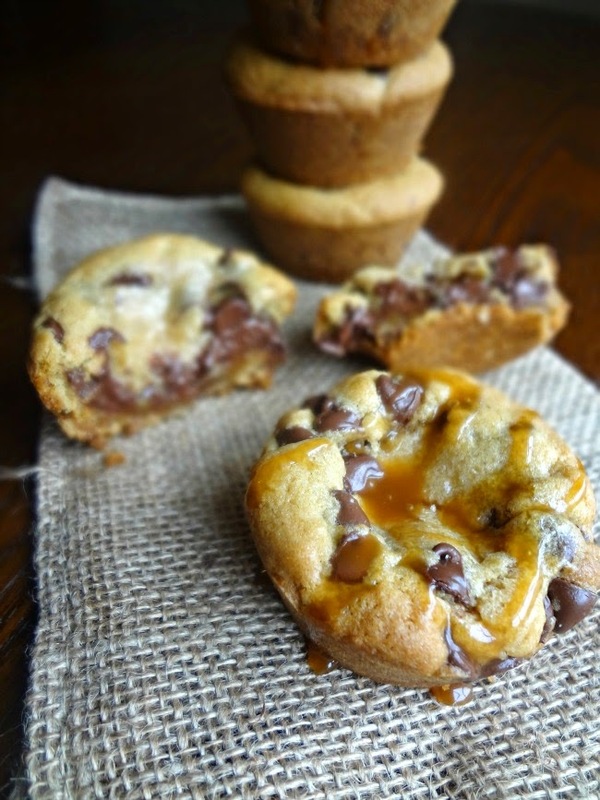 The browned butter adds that bit of depth, and the caramel drizzled on top with the salt adds that mmm mmm salty goodness to the sweet. The graham cracker crust is buttery and delightful and...chocolate chips...always our friends. They're crazy addictive and simply irresistible. Find out for yourselves, my friends! 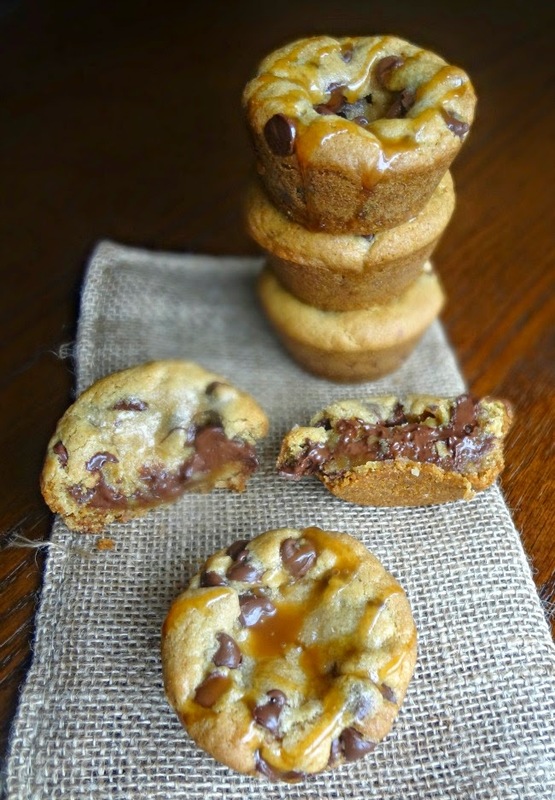 Adapted from Confessions of a Baking Queen's "Pretzel Crusted Salted Caramel Chocolate Chip Cookie Cups"
Extra sea salt or kosher salt, for sprinkling on top. To brown the butter: In a small-medium (preferably light colored) saucepan, over medium heat, melt butter and whisk continuously as it foams and bubbles, until little brown bits form and it begins to turn amber. Immediately transfer to a large, heatproof, bowl (making sure to scrape in all the little brown bits). Let cool for 5 minutes. Whisk together flour, baking soda, 1 tsp. salt, and cornstarch together in a medium bowl. Add 1/3 cup salted caramel and the sugars to the slightly cooled browned butter. Cream together for about a minute or 2, until fully combined. Beat the egg, yolk, and vanilla into the butter mixture. Slowly mix the dry ingredients into the rest. Fold chocolate chips into the dough so they're evenly dispersed. Cover the bowl and chill the dough in the refrigerator for at least 3 hours. Preheat oven to 350F degrees. Grease a 12-cup muffin tin. Mix together the graham cracker crumbs with the 1-2 tbsp. melted butter (you'll want them moistened but not soggy). Scoop 1 tbsp. moistened crumbs into each greased muffin cup and press down evenly (I used the bottom of a cup). Scoop a heaping 2 tbsp. sized ball of chilled dough onto the top of each crumb bottom. Press down if you'd like (not a must, though). Bake 15-20 minutes, until golden brown and somewhat set in the middle. Let sit in the pan to cool for 20 minutes. Sprinkle with some sea salt or kosher salt. Either invert the pan onto a wire rack or large plate to remove cookie cups or run a knife around the edge of each cup and pop them out. 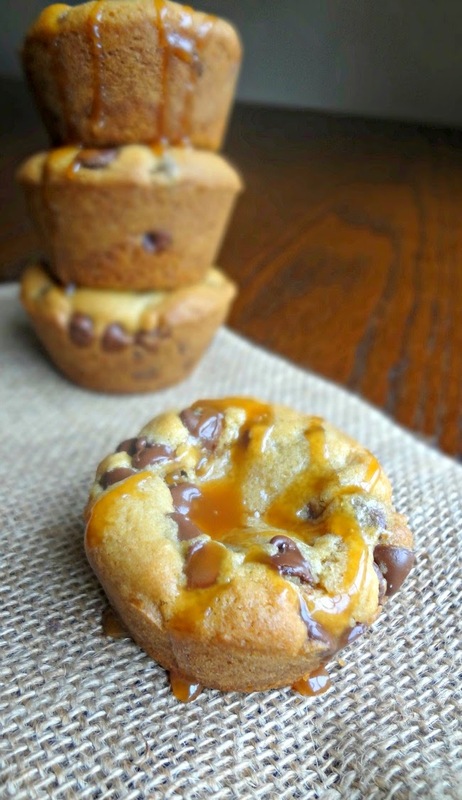 Drizzle with salted caramel and serve! Store leftovers in an airtight container for up to 5 days.